Below is an interview of Prakhar Dua, Dimple Singh and Saurav Agarwala of Symbiosis Law School, Pune. They won the 2nd Justice Dr. BP Saraf National Tax Moot Court Competition, held at National University of Juridical Sciences (NUJS), Kolkata. Interview has been taken by S. Aishwariya. 1. 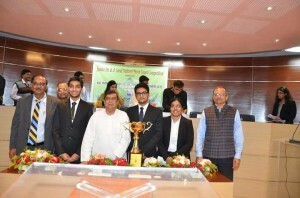 What was the primary motivation behind choosing to do the 2nd Justice Dr. BP Saraf National Tax Moot Court Competition? Prakhar: My key area of interest has always been Taxation Law and the aforementioned moot organised by AIFTP in collaboration with WBNUJS, Kolkata being one of the most prestigious ones fostered me to participate in this. Dimple: This moot being one of the few tax moots in India has an added edge of being organized by AIFTP (All India Practitioners of Tax Practitioners) and the same caught my attention. Additionally, the prestigious bench judging the finals motivated me to be a part of this moot. Saurav: Being just in my second year, I did not have much of an idea about the subjects that I liked, but accounts was a subject which intrigued me a lot. Believing that a taxation moot would include quite interesting accounting problems as well as because of the fact that it was jointly organised by AIFTP (Eastern Zone) and WBNUJS, I decided to do this. 2. How was the process of preparation? How did you go about the entire stage? How long did you work on the problem, and what was the most challenging phase? Prakhar: The process of preparation comprised of team meetings, lengthy discussions, research, drafting and the pleadings practice. After comprehending the problem properly, we divided the issues amongst ourselves and commenced researching on our specific parts with the drafting going on simultaneously. We couldn’t work together at a stretch because of our exams and internships in between and this gave rise to the most challenging part of it viz. to work with proper coordination. Dimple: The problem was related to search and seizure. It was an intricate one because of which after a general research we divided the issues at an early stage so that one can concentrate on specific parts. The research stage for me was the toughest which was the reason that it actually took me the most time. Though I started working as soon as we got the problem but there were the 2 hyper weeks when I use to wake up and sleep in tax. Saurav: The process of researching for the moot, was the best part during the phase of preparation for the moot as I learned something new everyday. For me personally, there were quite a few problems while doing the issues I was supposed to do. But the most difficult thing for me was drafting of the issues. Being an unexperienced mooter, this stage was really difficult for me, but here came my seniors, who were the people who taught me the intricacies of a good drafting. 3. How was it like working with the team? Did you never have conflicts? If you did, how did you resolve them? Prakhar: The team indubitably was great. We all were from different years and this perhaps lead to the benefit of the team adding a tinge of novelty along with the experience throughout the moot proceedings. As it’s obvious that when people work together as a team, clashes and difference of opinions are bound to happen; however this interestingly, is one of the best parts in a moot as you learn to work in a team and emerge out victorious. Dimple: Our team consisted of 3 people from 3 different batches because of which we were almost never together during the research stage. But the good part was that each one of us has a different perspective and thought process which though invited conflicts but at the end of the day enriched our arguments and reasoning. Saurav: For me, working with this team, was like learning something new every time we met. Conflicts happen because there are opinions and opinions are good for the team. Hence, I would say that these conflicts are rather the strength of every team and the same applied to our case also. 4. What do you think are your team’s fortes? This could even be every individual members’ talents and how it helped the team go further. Prakhar: I think a good team for a taxation law moot must have a blend of people who are hardworking, who can think out of the box (for coming up with some novel arguments and contentions) and who are always ready to face challenges during the competition (of course, in addition to having good speakers and researcher), and our team, undoubtedly, had all the aforementioned attributes which led to our victory. Dimple: Prakhar is a brilliant speaker and Saurav has an innovative outlook. Because of the same we always had arguments different from the other teams we faced giving us an upper hand during the pleadings. Saurav: This team had a perfect combination of people for doing a moot. Prakhar, being the experienced and the argumentative one and Dimple being the hardworking one, made our team the best possible combination for a taxation moot. Also, both of my other team mates are excellent pleaders, which gave us an extra edge over the others. 5. Were all the team members already experienced in moot court competitions based on taxation laws? If not, how did you approach a field of law relatively new to you? Prakhar: Amongst us, only I did a taxation law moot beforehand; however, that was on International Taxation. This one was on a problem based on contentious issues related to one of the provisions of Direct Taxation; therefore, it was apparently a new area of law for all of us. But, taxation law being so interesting and challenging compels you to delve deep into it through extensive research and interpretation. In the course of this, we are very grateful to our college authorities for providing us with all the books and research materials we needed which also enabled us to get second highest memo score out of all the teams participating. Dimple: Saurav and I are first time mooters. Though Prakhar did a tax moot before, the subject involved was International Taxation. This was one of the biggest hurdles as none of us were aware of the intricacies of taxation law that was required in this moot. So we approached the problem by starting from the very basics and then moving ahead step by step accordingly with the moot problem. Saurav: As Dimple mentioned, this moot was my first external moot. Having just passed my 1st year, I barely new any law subjects nicely, so with the help of my team members and my seniors I tried to learn the basics of taxation law. 6. How many teams were you up against in the competition? Which team would you consider to be your toughest competition? Dimple: We went up against total of 5 teams, 2 in the prelims and then had knock out rounds from quarters to finals. My personal favourite is the finalist team of RGNUL Patiala, since they had the best research of all the teams we went against. Saurav: As already mentioned, we had to face in total 5 teams in the entire competition. Having an excellent memo with great arguments, even I would consider RGNUL, Patiala, the toughest competition. 7. How was the final round and who were you up against? How would you describe the opposing team? Prakhar: For me, the final round was very exciting, intriguing and was like a dream come true as I pleaded in front of a formidable bench consisting of Former CJI, Former Judge of Supreme Court and the three sitting Kolkata HC judges. We were against RGNUL, Patiala in the finals and they were indubitably, a very good team to have as an opposition, not only because of their well researched and drafted memo, but also because of their speakers being articulate and thorough with the arguments put forth. Dimple: For me to plead in front of the bench with judges of the Supreme Court and High Court was the reason of choosing this moot. It was a round filled with excitement with the bombardment of questions and the nervousness of standing in front of such a prestigious bench. That was the time when I felt like a lawyer, thinking on my toes to defend my client. As I have said earlier that RGNUL Patiala was in the finals with us and were the best competitors one could wish for in the finals. Saurav: Having pleaded the Revenue side for three times, I was quite confident for my team in the finals. Also, most of the arguments which the other team had raised, we had already pre mediated and were prepared for rebutting the same. Also, the gesture of the Former CJI, of making the researchers stand during the finals and applauding their efforts, was a moment I would like to cherish throughout my life. As already mentioned, the team from RGNUL, Patiala had great arguments to make and it was great competing against them. 8. What message would you like to pass on to the mooters and the non-mooters? Prakhar: To the mooters, keep mooting; to the non-mooters, start mooting. Dimple: This being my first moot will always be a special one and that feeling of accomplishment which you get after the memo submission and after every round of pleadings is the real return of your blood and sweat and I feel we all deserve to taste the same. So for the all the mooters keep up the good work and for the non mooters, give mooting a chance you may end up loving it. And to all the law students- do a moot once in your law school as this is one of the few things you can only experience in college. Saurav: To the mooters, do a taxation moot, its really interesting. To the non mooters, mooting is something which teaches you things which the normal syllabus would never teach you. Also, when you start doing it, do not treat mooting as a thing just to add on to the CV, I guess its much more than that, mooting makes you a better lawyer. 9. Final comments on the level of competition and the organisation of the competition. Prakhar: The level of the competition was high with all the teams being well prepared and thorough with the problem. The organisation of the competition was smooth and timely and clearly reflected the amount of hard work and dedication put forth by AIFTP along with WBNUJS. Dimple: The moot had one of the most difficult problems in one of the most intricate legal areas that was tested by the best tax practitioners of India making it one of the toughest tasks I have handled till now. Organization was in collaboration with AIFTP and WBNUJS who had a welcoming approach towards all the team throughout. In my personal opinion it is the city of Kolkata that holds the charm. Saurav: The best part of this competition was the moot proposition. It was unique in itself and was really interesting. Students, coming from all the prestigious colleges of this country made this competition, a really challenging one. However, no moot could be a success without a great organising committee. So, credit goes to AIFTP (Eastern Zone) and WBNUJS, for organising this competition without a glitch. 10. Finally, a quick comment on mooting at your college. Prakhar: Symbiosis Law School, Pune has a very encouraging and motivating ambience as far as mooting is concerned. Our Moot Court Association (MCA) constantly works to provide ample opportunities to the students who are interested in mooting activities and emboldens them who seek to commence with it. The college authorities also help us in every way possible and a well equipped library just adds colours to the feather. Dimple: The best part about the mooting culture in Symbiosis Law School, Pune is the opportunity it provides for all its students to experience a moot including compulsory mooting activities. The college is not confined to a pool of mooters participating in all the moots. Rather it encourages new people to moot for the first time even in their final years of college. Saurav: I believe there are two things that takes the mooting culture of our college to the next level. First, the encouragement and support from our seniors, who despite their tight schedule are always ready to help you. The second being, the Moot Court Association, whose support itself from the research stage by getting the teams a Research Assistant and a Strategist to the final pleadings time, wherein conducting the team’s pleadings in front of an expert, is a great effort on their part. So as you are pointing out , they are behaving like a typical lawyer. I see Symbiosis did a fine job there . P.s no place for cry babies . @Samarjit It was clearly visible who were the cry babies over there. Better keep your #PunditTalks to yourself. By commenting this u just proved how vulnerable u are. Please act mature instead of reacting in this manner. It’s a competition and that team has won if u had a problem raise ur voice in a proper platform instead of defaming the team who won on their efforts. We are one of the team, whom they faced us. Used such cheap tactics to qualify for the next round. This team didnt even know the basic things about Income Tax Act and they come for mooting.